Dylan Miller, left, and William F. Curtis, Teacher, US Government & Sociology. 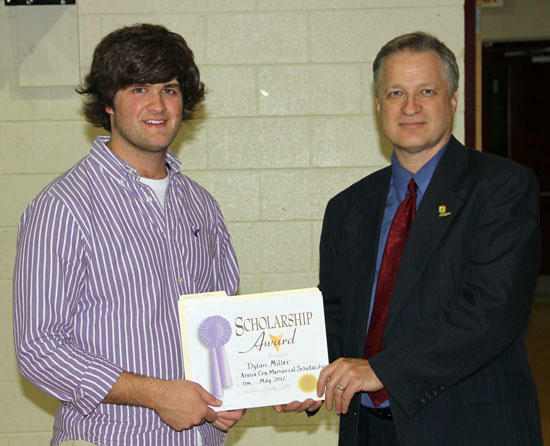 The Mrs. Annie Cox Memorial Scholarship Committee is proud to announce the awarding of a scholarship to Mr. Dylan Rogers Miller, Cannon County High School Senior - Class of 2012, who will graduate May 25th, 2012. The scholarship is in memory of longtime educator and beloved Cannon County citizen, Mrs. Annie Cox. 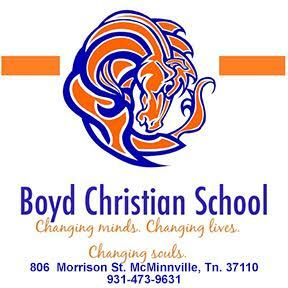 It has been established as an additional financial resource for a student intending to major in Elementary Education who has demonstrated achievement and based on need. Mrs. Cox was a very special person to all of Cannon County, and appropriately this scholarship honors her “Love for Education and Children, Character, Capability, and Need.” The scholarship personifies Mrs. Cox’s words, “I love to see children learn! I just love it! And want to make a difference in the life of a child.” --- Mrs. Annie Cox. The Scholarship amount was $1500.00 in which Dylan will use toward his demonstrated need to attend Tennessee Tech University. Dylan intends to major in Elementary Education. He is the son of Danny and Tina Miller of Woodbury. The Mrs. Annie Cox Memorial Scholarship is awarded annually to a Cannon County High School Senior that is on track to graduate this year, have an application pending to or acceptance received from a state accredited two or four year college/university, recommendation of a CCHS faculty member, intending to major in Elementary Education, and write a 300 Word Essay entitled, “Why I deserve this scholarship, and why do I want to be an Elementary Teacher?" There will be various fundraising efforts by the committee to fund this scholarship including the Annie Cox Memorial Scholarship Car Show held in the Fall 2012.